Sugarcane is a grass plant that can be found in more than 30 varieties, has no fats and its juice is a 100 percent natural drink. Sugercane Juice is sweet, delicious, extremely nourishing and considered to be a real goldmine of health according to doctors and nutritionists. It is a summer drink that helps to overcome the sweltering heat causes diseases like Heatstroke and sessions of dehydration in a quite quick time. Let’s see some of the amazing health benefits of sugarcane juice here on this page. Sugercane juice has zero content of fat, cholesterol, fiber and protein but contains sodium, potassium, calcium, magnesium and iron. Sugarcane juice is a mix of sucrose, fructose, and many other glucose varieties. Hence, it is sweet to taste. Popularly known as “Ganne Ka Ras”, the juice is not just another drink, but one of the healthiest drinks that refreshes your body. We have listed here 8 Amazing Health Benefits of Sugarcane Juice. Sugarcane juice in summer Is a strong energy booster as it contains the large amount of glucose along with an other compounds. The glucose and other an electrolytes make it an instant pick up. Sugarcane juice is alkaline in nature because of the high concentration of calcium, magnesium, potassium, iron, and manganese, which helps prevent diseases like cancer, that cannot survive in an alkaline environment. Thus it helps in fighting various types of cancer such as prostate and breast cancer. 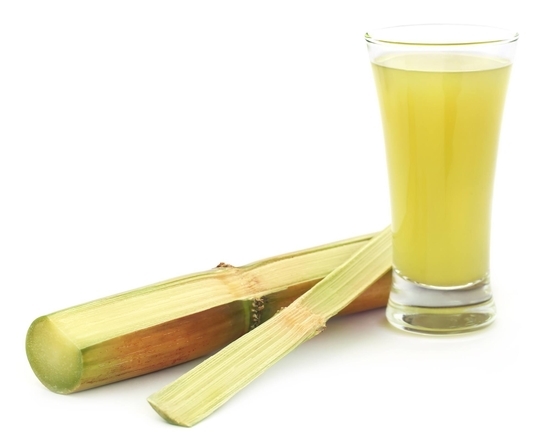 Topical use of sugarcane juice can help reduce and cure skin problems such as acne. Sugarcane juice contains alpha hydroxy acids (AHAs) like glycolic acid, which increase cell turnover. They also exfoliate the skin, eliminating chances of acne buildup. According to Ayurveda, sugarcane juice helps strengthen your liver and is thus suggested as a remedy for jaundice which is generally triggered by poor functioning of Liver. Sugarcane juice does is replenish your body with proteins lost and nutrients that it needs to recover quickly. Being rich in calcium, the sugarcane also ensures proper development of the skeletal system, bones and teeth. It is extremely rich in minerals including calcium and phosphorus. Sugarcane juice helps build tooth enamel, strengthens teeth and ensuring they are prone to decay. It helps to prevent tooth decay and bad breath. If thought sugarcane was bad for diabetics, mistaken. Sugarcane has glucose but also has a low level of glycaemic index than instant sugar, making it the perfect energy drink for the diabetics. As sugarcane juice reduces the bad cholesterol levels in the body and has natural sugars, it helps in reducing weight. It is high in soluble fiber which aids in shedding weight.